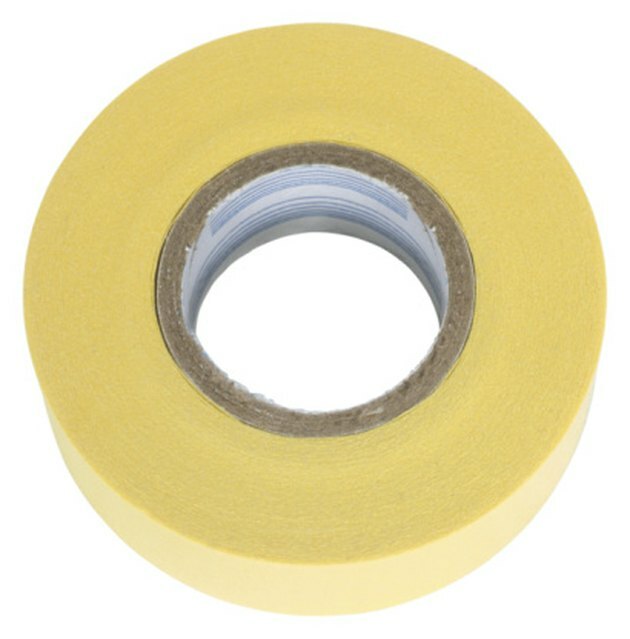 Masking tape is commonly adhered to walls for painting purposes. Sticky adhesive residue can remain on walls even after tape is removed. Airborne dust particles and grime can adhere to the gummy residue, making walls appear dirty and unkempt. Tape residue becomes more bonded and difficult to clean the longer it remains on walls. Promptly remove tape adhesive to maintain the wall's overall aesthetic appeal. Remove tape residue from walls using basic supplies and techniques. Tape adhesive leaves gummy stains on walls. Scrape off the excess residue from the wall, using the butter knife. Apply light pressure to the knife to prevent scratching the wall. Remove as much residue as possible. Inspect the wall for remaining tape residue. If sticky gunk remains, hold a hair dryer 4 inches from the wall, recommends the website Ron Hazelton. Aim warm air from the hair dryer onto the wall until the tape residue softens. Scrape off the softened residue with the butter knife. Apply more heat to the residue if necessary. Moisten a clean cloth with warm water and wipe the wall to wash away any remaining residue. Dry the wall with a clean towel. What Will WD-40 Do to a Wall?